How long have you been reading this blog? Now be honest. It doesn't matter if it's been a month or a year. I just want to tell you that I'm grateful. Really. I may not always follow through with my commitment to inspire, educate and entertain. But you're still here. It's starting to feel like a job. I know, it sounds horrible. That word job, it just sounds icky and depressing. I mean, I quit my last corporate job 3 years ago because it no longer felt right. It sucked the joy and creativity out of me. But blogging, blogging has always been fun. It's a wonderful outlet to share to the world what I had discovered that day. It's a great way to interact with other travelers from all over the world. It's always fulfilling to do small things with great love. But lately, I'm sorry to disappoint you. I can't say my heart has been 100% into it. You can tell, can't you? I guess when you've been doing something long enough, it starts getting stale. 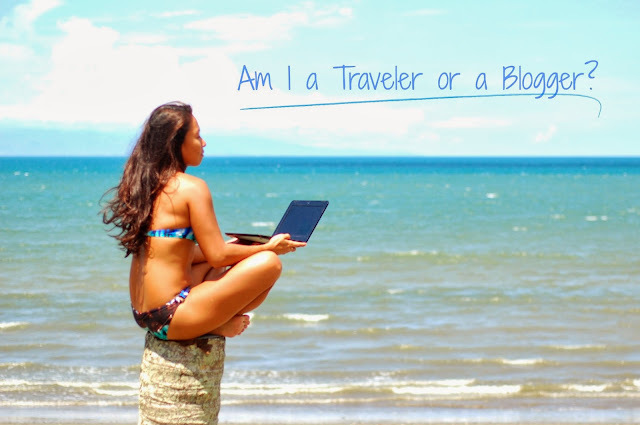 So what's a travel blogger to do? Should I wait until the ink runs dry and I have nothing interesting left to write about? Should I just take a vacation from my vacation? A few minutes ago, I found a word document that we had compiled a few years back, right before we started this blog. It was titled "Websites to Inspire". My heart leaped when I saw it. It brought me back to a time when this blog, We Are Sole Sisters, was just a dream project. We looked through blog after blog every single day. We marveled at stories written from obscure corners of the world. We nodded and laughed and cried along with these people who were generous enough to let us live vicariously. They sustained us every day at work when we felt so caged in that it was hard to breathe. So what did I do with the list of websites? I hurriedly opened browser after browser of URLs. I felt like a teenager who had unearthed a little toy box that my 5 year old self had previously buried. I wanted to read through the blogs that my past self had adored and followed. Where are they now? What I discovered was pretty unnerving. They had died a natural death. Out of 100 something links that we had compiled,only a handful were still active or updated. Some didn't even bother to renew their domains. Others made their sites private. A few posted once a month but their site looked like they had accumulated dust and cobwebs. I guess even the most wondrous of journeys have a return flight. But why? Why would you shut down a place that held your best travel memories? It's that feeling that every minute I'm spending online, I'm robbing myself of a minute of living. After facing a laptop for long stretches of time, I'm starting to crave for real world relationships and real world experiences. It's not that my online connections are any less authentic. But there is this raging desire in me to feel and touch and taste and not be obligated to take photos or write about it. I need to stop thinking in status messages, photo captions and blog titles. I have this need to step back. To quietly observe and just be. I'm know I'm not alone in this. Even Adventurous Kate went through hell in Bulgaria. I could totally relate to her feeling of being chained to her laptop and limiting her destinations to countries with good wifi. Jessie on a Journey shared the realities of travel blogging and it's not always pretty. There are times when you just can't travel as much as you want or have to find creative ways to supplement your income. Ed Rex had to deal with depression and feeling like a failur. But he bounced back and created a plan on how to turn the negative into a positive. Hasmita dealt with her burnout by taking a break and saying no to a few things. You all deserve to know the truth. Not just a half picture of how I (and many other travel bloggers) are living awesomely in some of the world's exotic locations. Working while traveling can sometimes take away the joy and freedom that we all long for. The challenge is to find that sweet spot between making a living and having a life. I must remind myself that I'm a traveler first, before I became a blogger. Have you ever felt the need to disconnect from the online world? Tell me I'm not alone by sharing your experiences in the comments section. Aww. You posted this at the right time because I'm going through the same thing. Yes, you are not alone. :) I used to blog about my travels in my solo personal blog, and because it was a personal blog, I wasn't pressured to post regularly or market my blog online compared to my now 2-month young travel blog. Before, I just blogged about my travels because I wanted to have a place online that will document my travel stories and memories, but it ate up so much of my personal blog that I felt like I needed to just set up a separate travel blog with branding, social media accounts, and all that jazz. It was fun at first, especially when I was writing down all the blog topics that I could think of. Every time I go on another trip, I'm always consumed by thoughts of "ooh, I should blog about this. Oh! this is another nice new topic idea. hey, i should take a photo of this for my blog". I have a full time office job so I set my weekends for blogging, but life happens and I postpone my blogging schedule. Now it's been almost a month since I've posted something new in my travel blog. It does feel like a job. And sometimes I tell myself that I wish I could just travel for the sake of traveling, no cameras and no notes. You perfectly described what I'm feeling Gem! My brain is constantly thinking of ways to document a place or an experience. I have to keep reminding myself to enjoy the moment. Thank you for sharing your own story. I'm so glad there are others like me who are turning things around and continuing the work they set out to do. Keep on traveling and blogging! It's so reassuring to know I'm not alone. Thanks for dropping by Missy! You're always doing a great job of documenting your travels Renz! Your talent and passion shine through your work. You inspire me! As a traveler, I try to remind myself that I don't always have to write about my travels. And, as a writer, I tell myself that my writing doesn't always have to be about travel. I never allow the need to document the trip get in the way of my traveling. Whenever I feel that, I automatically shut down everything and just soak in the here and now. So yes, I don't get to be among the consistent travel bloggers, but I make sure I feel what I want out of my travels. Primary purpose first, I always remind myself. But as they say, the burnout could just be a hump on the road; and you could be right-- the universe must be driving you to another chapter of your journey. Brace yourself. You're onto something better. :] Travel on, Lois! Thanks for sharing those beautiful words Claire. I love your traveler/writer philosophy! I miss talking to you. I always see your wins on facebook and know you have accomplished so much since our last chat. You're awesome! Hey Jayme! Thank you so much for your encouraging words: "the burnout could just be a hump on the road; and you could be right-- the universe must be driving you to another chapter of your journey. Brace yourself. You're onto something better." I already feel I am! Thanks for sharing! Hey there Angie. The funny thing about our blog is that we started it as a means of income while traveling. It turned out to be a passion project. Thank you for your well wishes! I hope you start your blog soon. Don't worry about the burnout and pressure. It's definitely worth it. If not just for connecting with passionate and like-minded people like you! Hi Dave, thanks for sharing your words here. Such a beautiful reminder! You really inspire me too with your events and passion projects! I look forward to seeing you again. Maybe in April? Cheers! Such a beautiful reminder! You really inspire me too with your events and passion projects! I look forward to seeing you again. Maybe in April? Cheers! This is a very honest post!! Many bloggers that i know tells me that being a blogger is not that easy as many people think. It is indeed very time consuming especially when you have deadlines.. and sometimes you really feel BURNOUT. I salute you for letting all us know the real thing. What happened to your sole sister? I followed your site when you did a 6 months asian tour. I haven't been here in awhile. :) I'm glad you are living in Paris now. Few years ago when I was reading your blog, I was reading it at my desk in Paris. I used to work there. Then I got a job where I can travel ^^. But I'm glad your site is still alive!